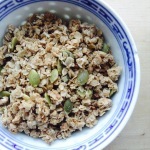 Hearty Spiced Granola – Dr. Melissa Lee ND., RAc. This recipe is a great meal to have especially in the winter time. It provides comfort can fill you up for a while. What's great about this recipe is that it incorporates many of the warming spices: Ginger, Cinnamon and Cloves. This recipe will definitely warm you up on a cold and rainy or snowy day. Combine all dry ingredients into a mix and mix well. Next, pour in the coconut oil and sweetener and Stir. Bake at 350 degrees Fahrenheit for 15 minutes. Stir the granola and then bake for another 15 minutes. Take out and let it cool. Add dried cranberries. Once cooled you can break it apart and store it in an airtight container.